Listed below, you will find the City of Springhill current water rates and policies. 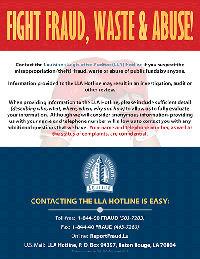 If you do not find the information you need, please contact our office and we will provide it for you. 318-539-5681 during business hours. Contact the Springhill Police Department outside of business hours at 318-539-2511 and they will contact the duty man to assist you. $5.50 per each additional 1,000 gallons of water above 3,000 gallons. Outside city limits: $30.00 minimum for usage up to 3,000 gallons of water. Residential: $20.25 minimum for usage to 3,000 gallons of water. not to exceed $36.75 per household. Commercial: $20.25 minimum for usage to 3,000 gallons of water. Other $1.00 - Safe Water Drinking Act that is required by the State of Louisiana. Fire protection fees fund Springhill Fire District 11 and help keep their services free to our citizens. Water bills are due by the 15th of each month. On the 16th of each month a $3.00 fee is added to all accounts with an unpaid balance. On the 19th of each month a $50.00 fee will be added to all accounts with any unpaid balance and are subject to being disconnected. Fees will be added regardless of dates falling on weekends. There is a $10.00 fee for all NSF checks. It is a violation of Louisiana Law to cut meter locks or otherwise tamper with meters. Violators will be prosecuted.